Welcome to Alumni Spotlight, a blog series focused on our alums – where they’ve been and where they are now. 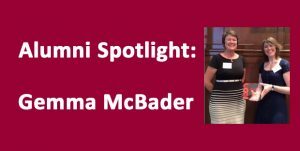 For this installment we interviewed Gemma McBader. After a short spell of contract work at the conservation department at Cardiff, I went on to work on the “Once in a Whale” project at OUMNH (I recorded the project’s journey in the onceinawhale.com blogs), after which I lead a team of conservation volunteers on an ungulate skull rehousing project. Since then, I have in the main part been making the most of my new life as a mother of two beautiful children. It is the most smile-evoking job in the world! Yes I have, although not for the private sector. I took on a couple of contract projects at UCL where they had a limited budget and a deadline to work towards. I have been quite fortunate in my career as a conservator before and after my time at Cardiff in that I worked on rather high profile objects and projects. I cannot pick a favourite project but without doubt my favourite work was spent at the British Museum’s organic conservation department. It is an incredibly stimulating environment. Cardiff is very well respected and its graduates have generally established themselves successfully in the conservation community. 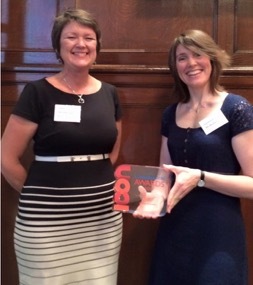 In the 2015 ICON awards, I won The Pilgrim Trust Student Conservator of the Year award for my MSc dissertation project. This in turn generated a lot of publicity which has given me recognition in spite of being in the midst of a career break. Thank you again to Gemma for taking the time to share with us. Shout out to the moms out there, both working and stay at home, for raising our next generation of scientists, artists, and conservators.